The 7 encounters herein are woven together via a subplot centering on the eponymous Equinox Crown and features a short summary of time travelled since the PCs have left as well as the number of miles they have since then covered – nice to keep track of distance etc. So what can the PCs do? Well, the trail of the Equinox Crown begins when the PCs have to essentially convince a small village to evacuate. In the night after that,. a traitor contacts the demonic forces, which results in the PCs having to fend off a couple of Hala demons and…getting the Equinox Crown. As l00t. Yeah. Somewhat anticlimactic. So, Jim Groves and Neil Spicer deliver us the Road to War here to make the journey more interesting – Legendary Games has already shown that Jim Groves can do journey-adventures well with Road to Destiny and thus I was looking forward quite a bit to this one. Unfortunately, I have to admit to being rather disappointed – it’s not the fact that this is not a module, but instead more of a chain of loosely linked encounters, mind you – the encounters per se are well-crafted, utilize terrain, come with LG’s trademark superior production values. That’s not the problem. Unlike all other LG-plug-in modules I’ve reviewed so far, this one feels a bit redundant in it choice of adversaries. 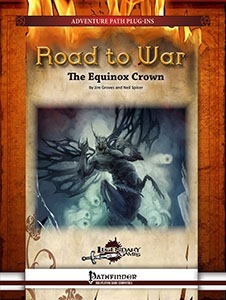 While I’m a fan of themed modules/APs where your primary opposition has a theme, certain tricks the PCs may adapt to etc., the foes herein feel a bit like random encounters, also thanks to the overarcing storyline around the Equinox Crown being simply, I’m loathe to say it, boring. The item per se is nice and has some distinct, cool abilities, but story-wise, there simply is nothing going on here – whether regarding the legendary item’s background or the link between encounters, this whole module lacks a compelling frame narrative. And consequence. The PCs don’t have to make any hard choices herein, even though several of the encounters practically hand the DM the necessary respective dilemma on a silver platter. Choice is what makes linear journeys matter – why not choose between arrogant nobles and redeemed criminals? Why not modify the army’s stats according to the decisions made? Certainly not due to a lack of capability, seeing how excellent Legendary Games’ “Ultimate Battle” turned out to be. Boardgame Review – Lord of the Rings living card game.